There are only so many luxuries you can take with you while your camping. A good sleeping mat maybe comes good camping cookware, your tent, extra layers, all of this should be included in your gear. If you’re traveling with larger groups, your whole family, or simply like some privacy with a couples getaway, then you’ll definitely want to include a camping shower tent. 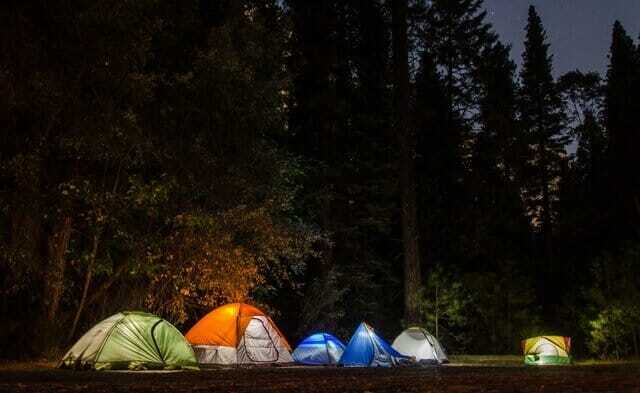 Camping shower tents are a bit of heaven in the great outdoors. They provide privacy not only for showering but for changing and using the restroom. This type of gear is one of the many reasons why camping is so much better today than it was 20 years ago! They aren’t heavy, they are not too expensive, and they are AMAZING for being comfortable showering out in the open. There are a few tricks to setting up your camping shower tent. You can’t just pop it up an expect it to stay in one place the whole trip! Here are some great tips for setting up the perfect camping shower tent! Camping shower tents are generally made from incredibly light and breathable fabrics. This makes them easy to fold up and transport, but also really easy to blow away in heavy wind! Weighing down your camping tent will not only keep you from having to run after it in a breeze but also keep it from floating away while you’re using it! You can use a lot of different things to keep your shower tent from leaving the campsite unattended! Rocks are a great tool for holding down your shower. You can not only use the ties and stakes but a few rocks in the corners of the shower tent. The best camping shower tent brands come with empty, heavy duty bags. These are used to fill with sand or rocks to keep it from flying off! The perfect camping shower tent set up is all about location, location, location! You don’t want it too far or too close. You have to find that sweet spot, just like where you have your campfire or where you’ll keep your electric smoker! Here are some tips for finding out where it should go! Water from your showers can drain down to the tent area! If you’re using it as a toilet also, then there may be some smells you don’t want too close to camp! Noises can be heard by a lot of people out in the wild! If your shower tent is too close to the site, then all your friends and family may be subject to all the embarrassing noises of a late night commode run! Don’t make it too far that you can’t find it late at night! If you forget an article of clothing, or a shower essential, then you’ll have to walk a while to get it! Your shower tent has to be right where Goldilocks would want it. Not too far, but not too close! Setting up the most functional camping shower tent is all about the parts that come together to make it multi-purpose. It can be used as a shower tent, changing tent, or a toilet room. Here are a few things you’ll need to make that all possible. Shower Bag, shower head. Camping shower bags are large and can fit a good amount of water in them. They typically heat up using the sun! Most camping shower tents are made to place these bags on their mesh roof. Laundry Bags. This is something that you can take too and from your tent. Just a small bag for your dirty clothes, or one large bag for your whole family’s clothes. Camping Toilet. Camping toilets are basically fancy travel buckets. They can be moved easily in and out of the tent to make it usable as a shower also! Even though you’re off camping, it’s important to make sure that you and your family shower and feel comfortable on your long holiday. Though it’s not necessary to shower every single day, it’s still an added plus to have the privacy while camping in large groups! Finding just the right spot, making sure it is heavy enough to withstand some wind and rain, and keeping all the extra parts in order will make for the perfect set up for your camping shower tent! Your whole camping crew will love the privacy it affords and enjoys the camping experience so much more!